For the past eight months, protestors have managed to maintain peace in their uprising against Yemeni President Ali Abdullah Saleh, but the President has managed to retain power in Yemen. The peace ended this week as the power struggle between President Saleh, Major General Ali Mohsin Saleh Ahmar and escalated to a violent attack on the protestors resulting in many deaths and injuries. As the violence escalates in Yemen, prospects for a peaceful transfer of power dwindle and fears of a civil war escalate. It is most likely that President Saleh will not resign now, and even if he does, his sons will be in key positions to carry on the Saleh reign. President Saleh has refused to resign for several months now, despite international and local pressure. At one point, President Saleh had the support of Western nations, including the United States, because of his resistance to Al-Quada. However, as the conflict within Yemen grew worse, the Western nations withdrew their support. Even Saudia Arabia, where President Saleh is currently recovering, is pressuring him to resign. The Gulf Co-operation Council (GCC) tried to work out an agreement for President Saleh to resign. 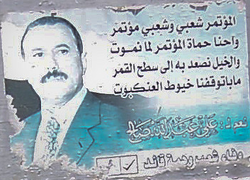 President Saleh manifested a commitment to such an agreement, but ultimately refused to sign it. This is most likely because President Saleh is unwilling to relinquish the power of his sons along with his own, especially if the agreement does not call for the relinquishment of the power of his opponent’s, Ahmar’s, sons. Most recently, President Saleh issued a decree, which granted Vice President Abed Rabbo Mansour al-Hadi the power to make an agreement for a transfer of power. However, this is most likely another strategy to delay any transfer of power with no intent to sign on President Saleh’s part. Mohammed Qahtan, leading member of the Joint Meetings Party (JMP), calls any further negotiation a waste of time because the revolution will continue no matter what and protestors will accept only President Saleh’s resignation. Jamila Raja, former Yemen official and advisor to the Foreign Ministry, thinks the chances of reaching a transfer of power agreement are slim at this point. Mustapha Noman, Yemen ambassador, believes the violence was a deliberate attempt to destroy any plans and sabotage any attempts for a peaceful transfer of power. However, Yemeni political analyst, Abdul-Ghani al-Iryani, believes this decree holds more water than that. He says that President Saleh’s act of divesting legal authority in the Vice President is substantial progress because this allows Vice President Hadi to act as Yemen’s representative and decide what is in the best interests of Yemen. Most importantly, he says, this shows that President Saleh is finally letting go after holding on for so long. If President Saleh refuses to resign, this could lead to a civil war. But there is also the possibility that the situation could worsen if he resigns. After all, there may not a better suited leader at this time; it was President Saleh who resisted Al-Quada’s presence in Yemen. With the uncertainty of Yemen’s future, Al-Quada’s future in Yemen is also uncertain. In order to avoid a civil war, all parties must be willing to engage in discourse in order to reach a political solution. This seems unlikely considering each party has its own agenda that, undoubtedly, conflicts with that of the others.